The global sales of Sony smartphones have increased tremendously with the launch of their latest Xperia handsets: the Xperia U, S and P. Of them, the popular one which topped the smartphone chart is Xperia U. Its the latest Android powered next generation Sony smartphone to experience unlimited audio and video with an incredible 3D surround sound. Compared to other Xperia smartphones, Xperia U is the smallest one having 3.5" TFT display. The handset comes in a bar-shape and is complimented by its slim and elegant design. This latest Android phone is clearly targeted for the younger generations, but its affordable price tag and decent hardware specifications make it a perfect choice for everyone. Here, is a basic review on Sony Xperia U.
Super fast and incredible Internet experience. Dualcore Scorpion chip performance is top-notch. Runs on Android 2.3.7 (Gingerbread). Can be upgraded to Android 4 OS. Can be customised with changeable bottom caps. Can shoot videos at 720p only. Supports only 4GB with no storage expansion. Browser provided on Xperia U feels outdated. Its rivals are even more slimmer. Xperia U is designed perfectly to fit into your pockets or bags. 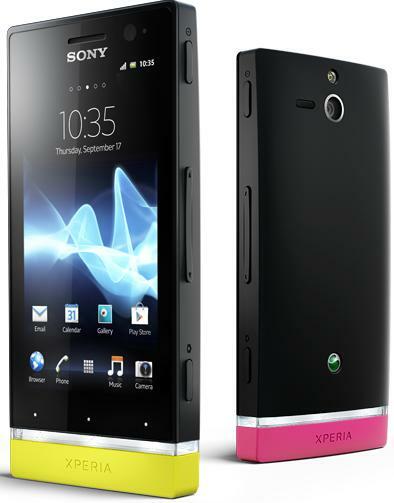 The interchangeable coloured caps and glowing transparent bar are a plus for Xperia U smartphone. The only concern for this handset is that it feels tiny in the hands, despite its good-looking build features. Xperia U has the same Sony interface that is commonly noticed on many Xperia series smartphones. Little modifications and tweaks are added to the lock screen, and it comes with 5 home screens to add your own icons and widgets. Xperia U even dedicates an entire home screen page to the social sites. As a mini version of Xperia S, the Xperia U comes with a touch plastic with strange mixtures of sharp angles and curves. It has charming, intriguing design along with a nice strip that also lights for alerts and notifications. The capacitive touchscreen is responsive, and the display supports 16M colours. The device supports multi-touch, and the display is protected by Sony's scratch resistant glass. Xperia U is a decent 3.5-inch smartphone that feels comfortable in the hands. The device has a thickness of 12mm, but it has a nice curve at the back that makes it feel like a thinner device. Xperia U is powered by Sony's custom dual-core NovaThor 1GHz processor and has 512MB of RAM. Its power button is located on the right side. This is annoying for some smartphone users who prefers it to be at the top of the device. One would expect 8 megapixel camera for a Xperia smartphone, but to their disappointment the latest Xperia U Android smartphone comes with a modest 5 MP (2592 x 1944 pixels) camera, along with a LED flash support. The camera is somewhat tricky to operate with its two buttons. The decent camera app delivers a quick response on time. Also, you get a pop-up preview to check your recent snaps. Xperia U camera supports Geo-tagging, 3D Panorama view, image stabiliser along with smile detection feature. Music playback is one area where Sony performs much better than its rivals in the Android market. The player has a simple interface and supports many formats including SMF, MP3, Ogg and WAV. Efficient graphic equaliser is added to alter the output. This smartphone can handle Mpeg4 video files up to 720p resolution and doesn't support Xvid or DivX. Xperia U is powered by 1320 mAh powerful battery decent for many hours of entertainment playing your favourite music and videos. The handset lasts for about 472 hours when on standby and up to 5hrs when listening to music or playing games. Xperia U is a good choice having bright screen with good pixel density, inspiring design, removable battery, and strong loudspeaker. This Sony smartphone just needs an improvement in the 5MP shooter camera department. Otherwise, it's a decent handset for the price. Sienna Williams is a techno junkie who loves to write articles and blogs on latest mobile phones. She also writes a lot of reviews and news on modern technology gadgets. Visit http://www.fonebank.com/ for more mobile related information.